There are some things that you just have to see to believe. Every year hundreds of thousands of people flock to the water in hopes of erasing the stress of the work week, catching some fish and avoiding adulthood for just a few hours before they are faced with it again. Then there are those like Florida firefighter James Taylor who prefer the stress of competition to the laid back relaxation that fishing usually brings. In Saint Petersburg Florida the St. Pete Open Spearfishing tournament was well underway when things took a turn that surprised everyone involved. While the fish that normally get caught in this tournament weigh in at some impressive numbers Taylors took the cake at a whopping 409 pounds! 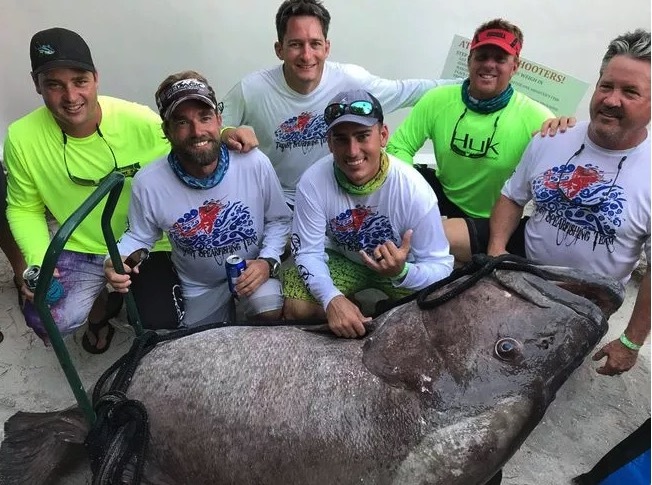 The unfortunate thing about this feat, however, is that while he may have taken home the largest fish, because the tournament was for Black Grouper his 409lb Warsaw Grouper was not eligible to win. Even though he may not have won this tournament he still walked away happy with his catch. As of right now, the largest Warsaw Grouper on record weighed in at a whopping 426 pounds however Taylor is checking in with the Underwater Spearfishing Association as to whether or not his catch is the largest Warsaw Grouper caught by spearfishing. Either way- it's an impressive catch! It sure could. On account of it’s so big. why didn’t you release, not good to eat? ?